Crumbly and fragrant, these Pistachio Cookies (shortbread) are the perfect melt-in-your-mouth cookies. 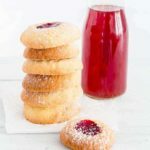 Make a large batch and freeze for an anytime tea time treat. These rose pistachio shortbread cookies, smell and taste amazing. About 10 years ago, I was lucky enough to be whisked off for a long weekend in Istanbul. Oh my gosh, I absolutely loved, loved, loved it. The beautiful architecture – oh the Hagia Sophia, the really stunning Topkapi palace and the Sultan Ahmed Mosque. Soooooo much to see and soooooo little time. But most memorable for me was my experience of the last few hours in Istanbul. I still remember my excited surprise as I stumbled across a market – the sights and smells of piles of spices; of nuts; edible flowers, was the best thing ever. Something that has stuck in my mind for ages. And as we were leaving it, there was some pistachio and rose petal halva which of course I HAD to try. That taste has stayed with me for a decade. I only have to think of it to start drooling. So these pistachio rose cookies are my attempt to bring a little bit of that moment back to life, and although it doesn’t have the stickiness or sweetness of halva, this recipe does carry the flavours I remember so well through. Smelling and tasting these pistachio shortbread cookies, I’m certainly transported right back to Istanbul. I wonder how soon I can get back there. 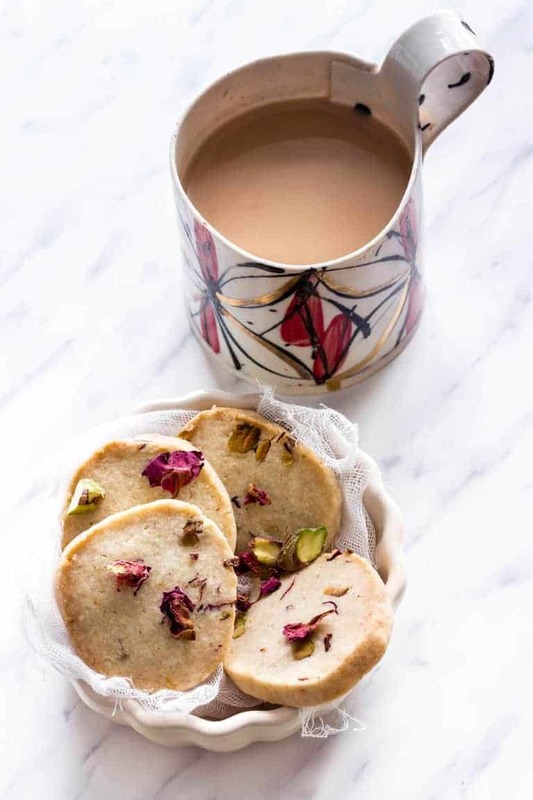 To get the maximum flavour for these easy pistachio cookies try and make sure you use as fresh pistachios, rose petal and rose water as you can. They will be much more fragrant then. 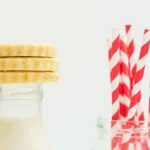 You can cut out the cookies in 2 ways. Shape into a log and slice, or roll out an use a cookie cutter. I tend to use a cookie cutter as my kids love cutting them out. Make the dough ahead of time, cut and freeze with baking paper between each shortbread cookie. That way you can simply bake them as needed. Just add another 2 mins to the baking time if baking from frozen. Shortbread is normally baked for a little bit longer at a lower temperature than most cookies. So please don’t be tempted to increase the temperature. If you want your cookies to have an even colour throughout then do turn them round. 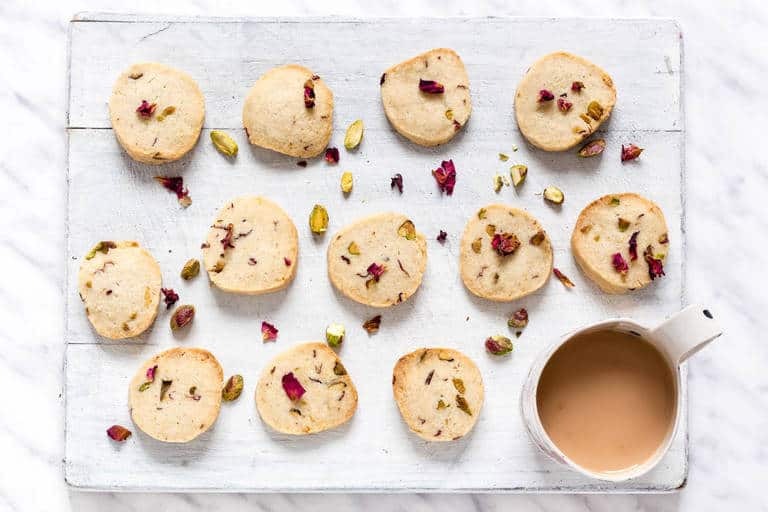 To turn these pistachio rose cookies into more simpler pistachio cookies, simply omit the rose petals and rose water and add approximately a quarter of a tsp of lime zest or other citrus zest and lime juice to your taste. So, so good. 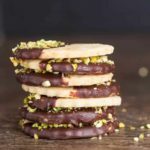 If you like pistachio desserts then why not check out this saffron pistachio cardamom butter toffee, or these pistachio baileys shortbread cookies with a chocolate baileys glaze and pistachio dust. 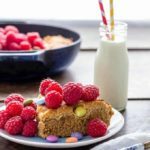 Cookie lovers, you could try your hand at making these lush Oat Cookies from Fuss Free Flavours too. They are packed with seeds, are crunchy and require no cookie cutter or rolling pin. Easy peasy and perfect right? 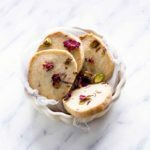 Here is how to make these Rose Pistachio Cookies. Please do try them and if you do make them then please do tag #recipesfromapantry on Instagram or Twitter so that I can pop over and have a look. It is really, really awesome for me when you make any one of my recipes. You can also share it on my Facebook page. Thank you for reading my Pistachio Cookies recipe post. And please come visit again as I continue dreaming up recipes, traditional African recipes, African fusion recipes, Sierra Leone recipes, travel plans and much more for you. 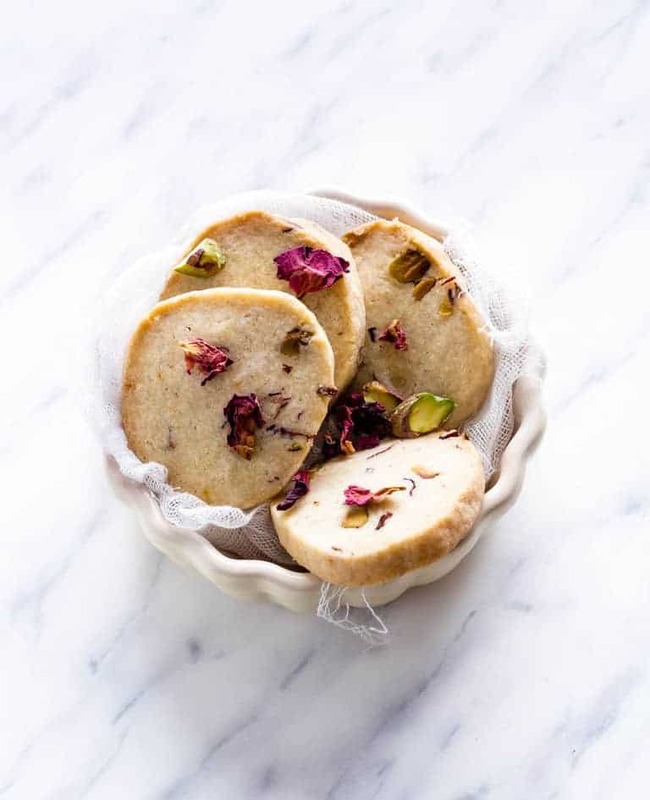 Don't forget to tag #recipesfromapantry on Instagram or Twitter if you try Rose Pistachio Shortbread Cookies! It is really, really awesome for me when you make one of my recipes and I'd love to see it. You can also share it on my Facebook page. Please pin this recipe to Pinterest too! Thank you for reading Recipes from a Pantry. Add the butter and sugar to a large bowl and cream together using an electric hand mixer till the mixture is light and fluffy. Mix in the orange juice and rose syrup. Then add in the flours, chopped pistachios, rose petals and salt and mix until you get a soft dough. If the dough is a little bit sticky then add in a tbsp or two of flour. Split the dough into two and shape each one into a disc, wrap in plastic wrap and chill for 1 hr minimum. Preheat oven to fan assisted 150C / 170C / 325F / gas 3. Take the first disc of dough from the fridge, roll it out on a lightly floured surface till it is about 5mm thick and then cut into your desired shapes (I use a 6cm diameter cutter) and lay on a lined baking sheet. Quickly scoop up the excess of dough, reshape, roll out and cut again. Repeat with the second disc of dough. You can freeze some of the cut shortbread at this stage. Bake the shortbread for 12-14 mins until they are lightly golden. Let the shortbread cool on the tray for about 10 mins before transferring it to a cooling rack to cool completely. Serve with extra pistachios and rose petals dotted around. A virtual 3 coming your way. I have made a similar cookie, rose with pistachio is match made in heaven!! I’ve never been to Turkey and sadly, now is definitely not the time to experience that part of the world. These cookies look amazing — I’ve never used edible flowers in baking before, but they are absolutely stunning! I’m a sucker for rose and pistachio flavors. Love that flavor to death. Rose and Pistachio are such a heavenly combination I love how well you cut and bake them. Pretty! Two of my most favourite ingredients – Rose and Pistachios.. Loved the combination and also loved the photography.. So simple yet so beautiful.. wow!!! I love food and drinks with floral notes! These sound amazing! Your shortbread are absolutely darling! I would love to serve them at a tea of wedding/baby shower. Well, now I have to try rose and pistachio together. I’ve never used edible flowers for anything other than salads. I have never t’ed this combination. I’m sure it not only beautiful, but also tasty! What a beautiful way to recreate memories of your travel to Turkey (one of my top destination to visit in my bucket list). I have always loved the combination of nuts with floral flavours and these rose and pistachio cookies are something that hits the note. I’m completely intrigued by the addition of rose petals! Can’t wait to try these!! I really hope you get to go. I imagine these are as good as they sound. I love the use of rose petals in bakery. I would love to experience a spice market such as in Istanbul, must be amazing. It was, I really would love to go back and visit it again. Those cookies are so pretty, and I bet they are delicious! My mouth is watering! They look amazing!